I’m a firm believer that after you run 26.2 miles, you should get to eat some absolutely fantastic. So of course, I can’t help but share what I ate on Saturday with you all. It didn’t disappoint. It was abso-freaking-lutely fantastic! 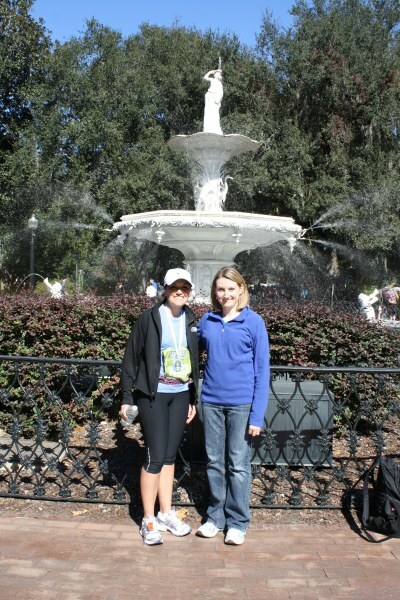 After the marathon on Saturday, we stopped by this famous fountain (which also appears on my medal) to snap a few photos. Note to self: hats don’t make the best fashion accessory for picture taking. After the photo opt, we walked (I hobbled) to lunch. 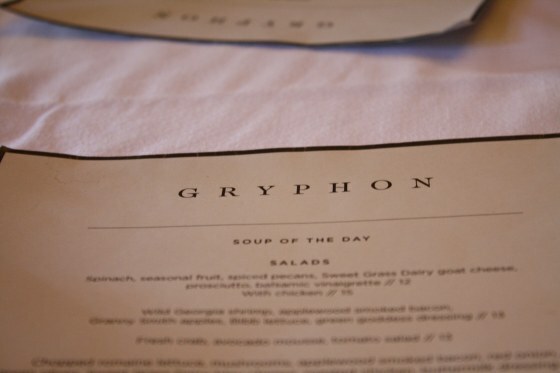 I really wanted to go the Gryphon Tea Room because it was absolutely amazing the last time we visited Savannah over a year ago. We were a bit under-dressed but they were happy to take care of me and several other ravenous marathoners. 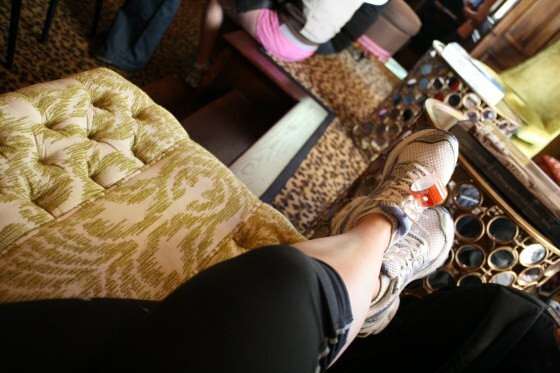 I put my feet up while we waited on a table. The menu and feel of the whole place had really changed since we last visited. 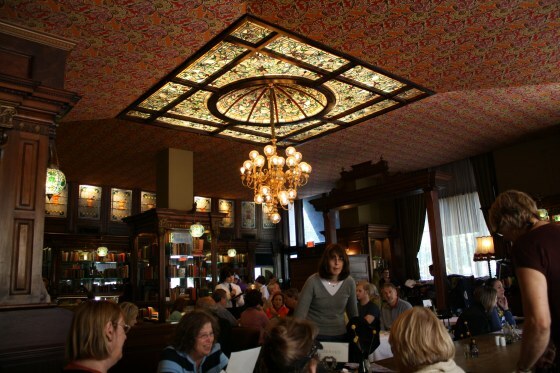 It has gone from a tea room that serves “lunchy” type things, but primarily baked goods, teas, and coffee, to an elegant restaurant. I started off with coffee. 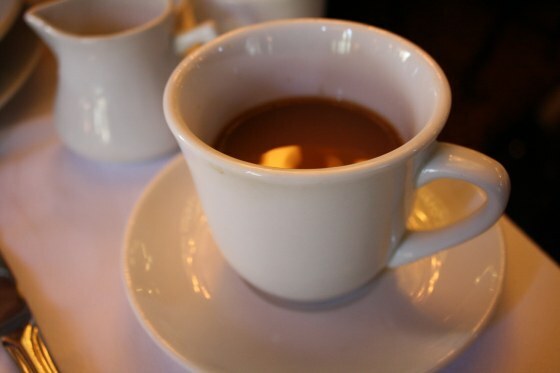 I love coffee after a chilly run and plus, caffeine helps with muscle recovery. Brad and I ordered vichyssoise to split. 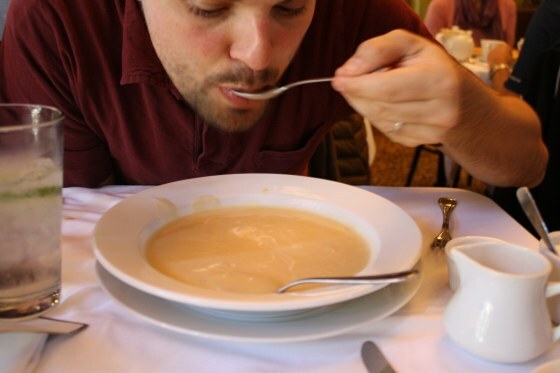 Vichyssoise is pronounced vish-ee-swah and is basically a creamy potato soup. And the only reason I know how to pronounce it is because I saw it on Looney Toons once when I was a little girl. What, you didn’t learn about French cuisine from Saturday morning cartoons? It was delicious, warm, and filling — just what I needed. Brad and I both ordered the pimento cheese sandwich which was served on a type of bread that was hybrid between crusty white bread and jalapeno cornbread. The creamy pimento cheese was absolutely perfection with thick cut bacon and onion confit. Brad and I discussed this sandwich at length while eating it and decided that the onion confit made the sandwich. I also had a green salad on the side, which was tossed with a really yummy vinaigrette. You know I had to get dessert. 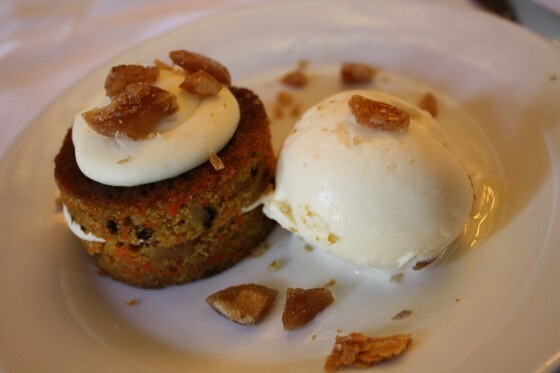 I debated between the brownie and the carrot cake the entire meal, but finally the icing won out. The candied pieces on the cake were delicious but the kept sticking to my teeth so I left them and inhaled every crumb and morsel of cake and ice cream. 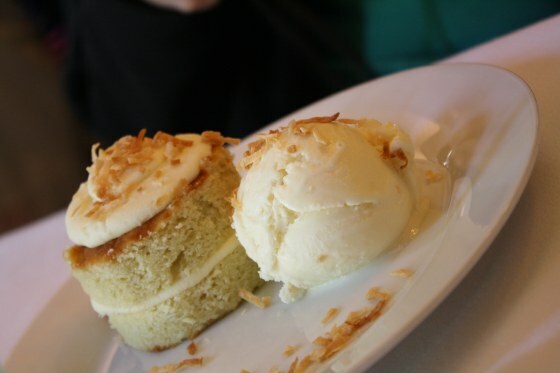 Brittney’s coconut cake was delicious too. Brad and I had this (but a much larger version) back when the Gryphon focused more on baked goods. The cake is dense, like a pound cake and the icing is creamy. Very yummy, but different than my family’s version which is much more light and airy. 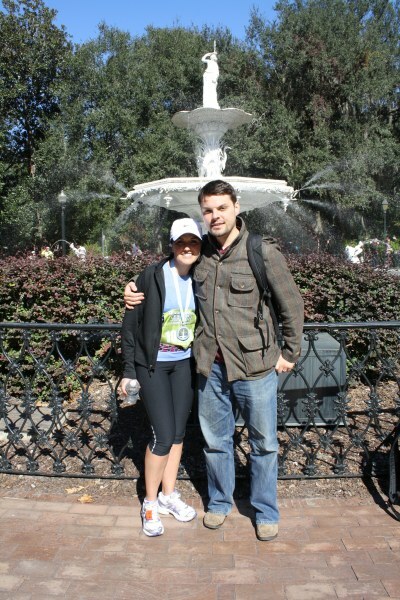 After lunch, we took the shuttle back to the car, then drove 45 minutes back to Savannah. We had dinner plans with a bunch of other bloggers but didn’t reach Savannah until 4 pm and I quickly changed my mind. I really wanted to hang out with recent friends I met at the Healthy Living Summit, but there was no way I was going to be able to shower and make the drive back to Savannah. This girl needed some rest! So apologized for not being able to make it and I rested. Specifically, I lied in a hot bath for quite some time and read a magazine. It was bliss. 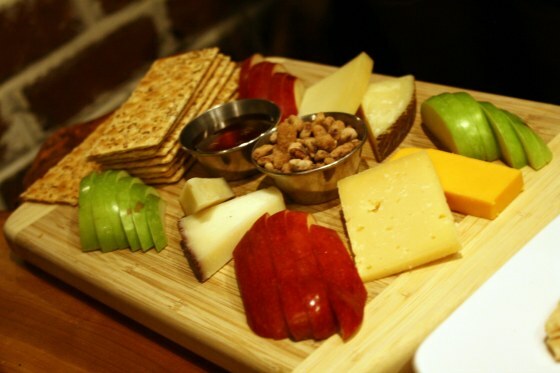 Then, Britt, Brad, and I headed out to Corks, a wine bar that also serves tapas, that came highly recommended by Brittney. Mmmm, wine was just what I wanted. 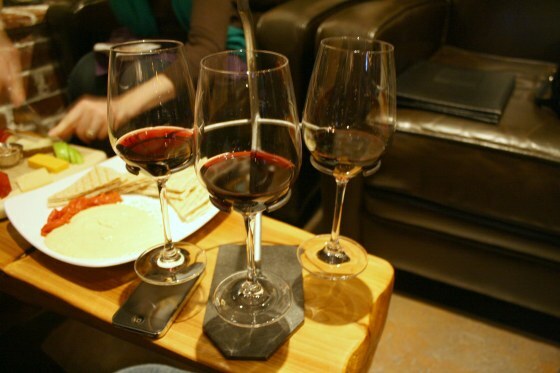 I ordered the interesting red flight and then later settled on a Shiraz. I was actually still pretty stuffed from lunch (my hunger usually kicks in the day after), but definitely had my fare share of this cheese plate. 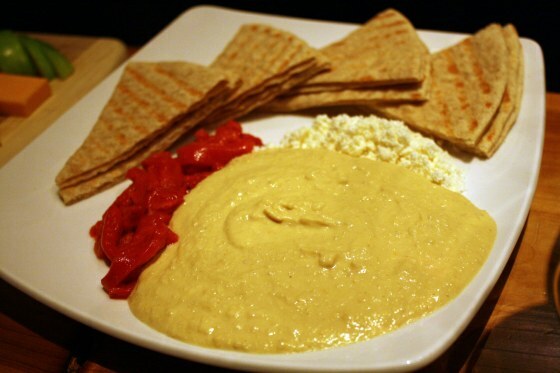 We also shared this creamy hummus with feta and roasted red peppers with pita points. The perfect end to a less-than-perfect race. I’ll take it. Haha! Me too Sarah, me too. Omg. Feta cheese and hummus. LITERALLY, nothing better. I need to combine those two more often! Celebratory eating is the best way to wrap up a marathon! I’m glad you didn’t forget to include dessert and wine. 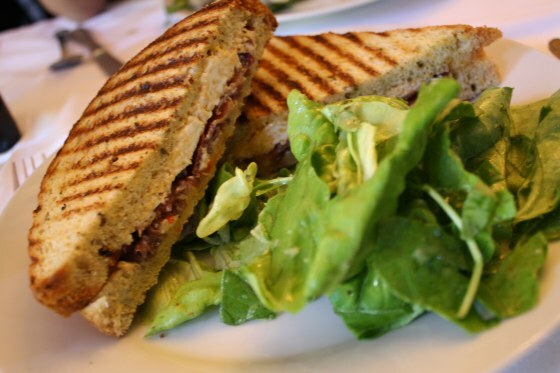 😉 I’d love to try that pimento cheese sandwich – it sounds and looks amazing! I usually eat Taco Bell burritos and frozen yogurt after a half marathon, but I really like the idea of really splurging on something a bit more decadent. I think it’s the whole needing to look presentable factor that I can’t get over. Most places near the finish line don’t care how you’re dressed — they’re just happy to have the business. all of those eats look amazing! I love hummus and feta cheese together! I never think to combine the two. But you’re right — soooo good!